You were told that you could catch 'em all. They lied. 1. Only being able to play in ten colors, or even worse, black and white. Seriously, the graphics have come a long way since the '90s. 2. 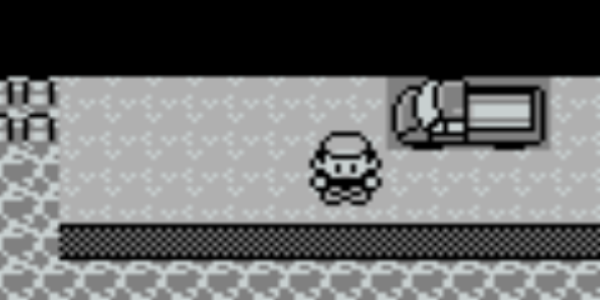 Getting past the first gym in Pokemon Yellow. Your only hope was to catch a Mankey on Route 22. 3. Beating a gym leader only to black out in front of the Pokémon Center due to poisoning. It was a possibility, but how else would you get infinite rare candies and master balls and Pokémon at level 255? 5. Your rival would show up at the most inconvenient times. To top it all off, he was completely insufferable. 6. Or even worse, Team Rocket shows up out of the blue. "Oh you wanted to battle? I'm exhausted from going through Mt. Moon, but sure, it's cool." 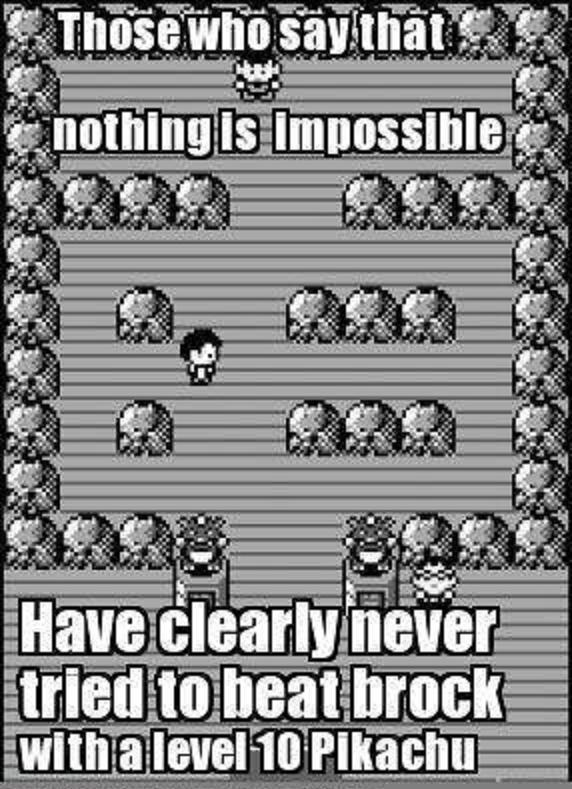 The only other way was to use your Gameshark and hack Pikachu's moveset. 8. 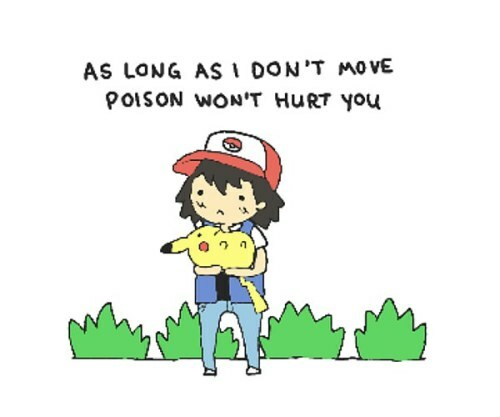 Dealing with Pikachu's antics in general. 9. Needing to be right next to someone in order to trade Pokémon. 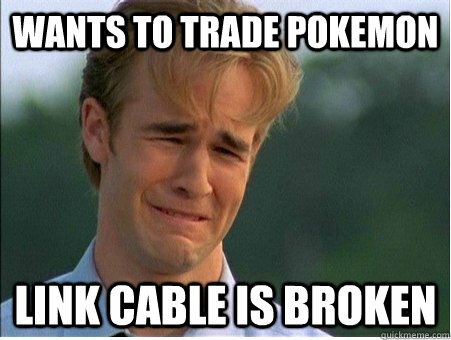 Before the days of wireless, there was the link cable. 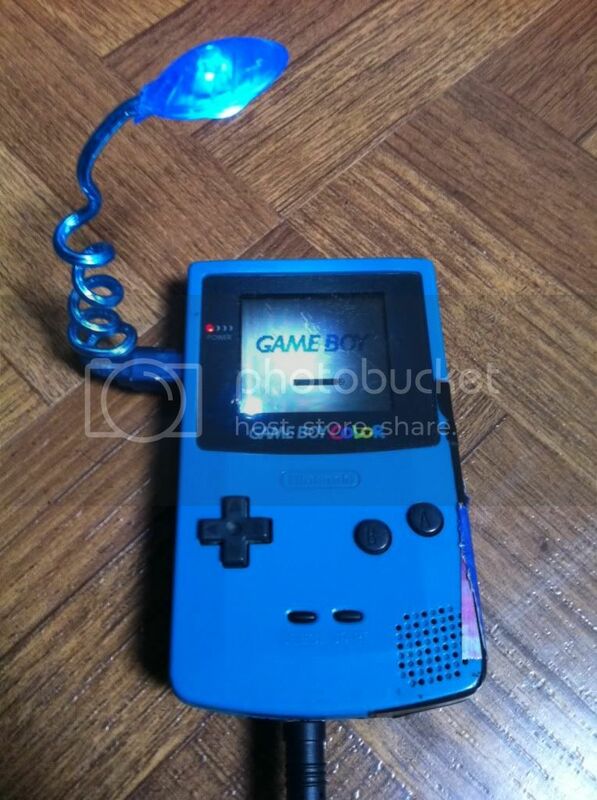 Well there was the Gameboy Light, but it was exclusively released in Japan and did not come in color. 11. Having to blow into your game to get it to work. When in doubt, blow it out. 12. Not being able to play as a female character. 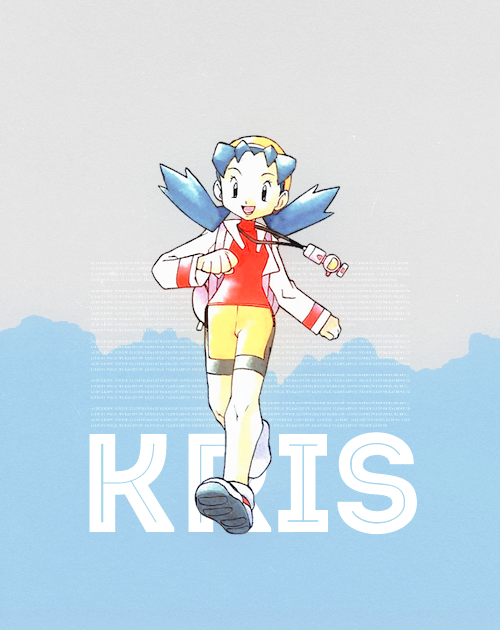 It wasn't until Pokémon Crystal in 2001, with the addition of Kris, that someone could play as a girl. 13. Not having enough space in your bag. 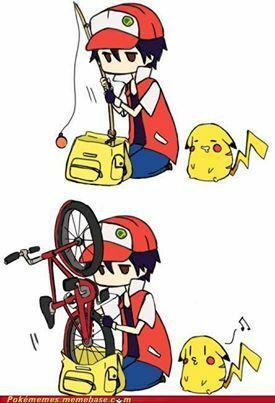 Sure you could fit a bike and 100 pokeballs, but if you have too many specific items it would be "full." You would either have to use up some of your items, toss them out, or deposit them in your PC box. To make matters worse, you couldn't delete certain key items, such as the S.S. Ticket, even though it was no longer useful. 14. The PC system in general. You were told what was under it, but the rumors were not true. 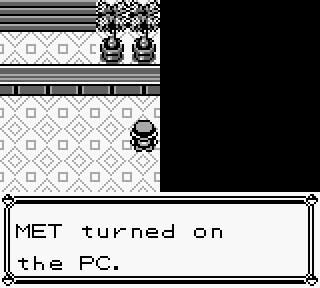 Mew was coded into the original games, just not hidden under that random truck. Since most of us couldn't get one through an official Nintendo event, we resorted to using this cheat. 17. The monotony of life after beating the Elite Four. After doing that, there was completing your Pokedex. However, it was much easier to do as long as you had a friend with the other version. Without online features, most of us ended up restarting the game every time. Kids these days will never know the struggle of having to use AA batteries.